Book Review: What is Biblical Theology? 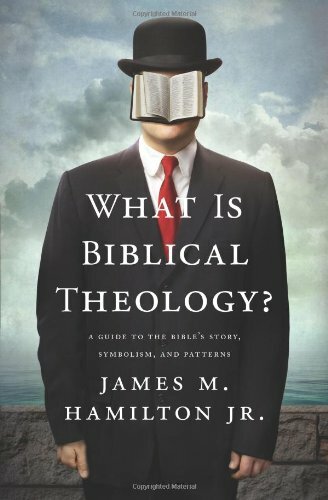 by James Hamilton Jr.
May 6 Book Review: What is Biblical Theology? by James Hamilton Jr.
Perhaps that is not the best of introductory quotes. Nothing in the Bible is “trash.” But it is an excellent testament to the heart of this book. And perhaps it also is an accurate representation of how the church “reads” the portions of the Bible that are least understood. Sometimes in the Old Testament, Bible study is more like “trying to find treasure” and less like devouring the full counsel of the Word of God. Let it be stated from the outset, What is Biblical Theology? : A Guide to the Bible’s Story, Symbolism, and Patterns is a must read. Written by James Hamilton Jr., the book is a sweeping survey of the Bible. Starting with creation and working to the second return of Jesus Christ, What is Biblical Theology? presents a comprehensive approach and high level understanding of the Biblical in its context. Written as a shorter introduction, What is Biblical Theology? avoids many important discussions that result from its thought provoking questions and statements. This book is no compass but offers an encouraging introduction for people seeking to understand how the Bible pieces together. Those interested in a deeper study are recommended to consult Hamilton’s God's Glory in Salvation through Judgment. What is Biblical Theology? is a short and dense book. Filled to the brim with Biblical imagery and application, the communication level is both high and moderate. From the perspective of terminology and general knowledge, Hamilton breaks down the material into easy to understand pieces and presents them in such a way as to make it easy to build upon. The chapters flow seamlessly and the occasional portion of repetition only seeks to solidify foundations. At the same time, a general knowledge of the Bible and its primary stories are essential. James Hamilton writes from a premillennial and credobaptist paradigm. Though this presents the opportunity for varying disagreement (namely in chapters 12 and 13), the overall tenor of the book is valuable to those of differing views. The valuable content of What is Biblical Theology? is not cemented to these opportunities for disagreement. Instead, the value and practice of Biblical Theology is written with laymen and general students of the Bible in mind. Individuals unfamiliar with attempts to summarize the Bible at such a high level may feel overwhelmed with the grandiosity of the connected story. But the value is in this high view. The lessons and information presented remain to be applied to the details of the Scriptures by the student. Things go unmentioned and difficult passages remain to be investigated. All of this results in an easy to read book with short chapters that makes itself presentable and accessible for the average church member. What Is Biblical Theology? is broken up into three parts: “Big Story,” “Symbolic Universe,” and “Love Story” or as Hamilton prefers “story, symbol, and church” (22). Much of the first part is well known to even the most casual of church attenders. This is not to say however that these simple facts are not pieced together in a better way. The value in Hamilton’s book is not the newness of the material but the connections revealed in the Scriptures. A high level view of the Scriptures brings to focus small truths and amplifies them in God’s story. The world is a cosmic temple. The church in the Holy Spirit begins the fulfillment of this preexisting truth. The narrative is centered on this and Jesus Christ as the fulfillment of God’s work. Or more succinctly “you aren’t the main character in the big story of the world” (29). This is the basis of Biblical Theology, that “you” should not enter into the discussion as much as “He” which is Jesus Christ. In the second portion of the book Hamilton focuses on the symbols pertinent to Biblical Theology. This portion more than the others provides a larger number of tools for Bible readers. It will also provoke the most intrigue for new readers of Biblical Theology. In spite of this, there remain many symbols that are deserving of full treatments that don’t receive an introduction here. But this is not to overshadow the value in the introduction presented. Coming away with questions is a good thing and this portion of What is Biblical Theology? supplies the questions. Focusing on the symbols that point more directly toward the work of Jesus Christ, both branches and the flood receive valuable treatment (chapter 7) and reach their climax in the “deconstruction” language found leading up to the destruction of the temple (72-75). While the language of the flood is rightfully brought into the understanding of Christ’s baptism on the cross, it is here that those of the preterist persuasion will find some fault. Though Hamilton’s work in in the Old Testament is not in disagreement with the preterist interpretation, he fails to carry over the obvious implications to both Matthew 24 and the book of Revelation. In the third section of the book Hamilton turns to a valuable look at the church. This all culminates in a strong statement concerning church membership, “A Christian who is not a member of a church is like a hand or an eye that is not joined to the rest of the body. Can it live? Will it be useful?” (102). The church is not a later development though it is in fact a mystery (Eph 3). This is also the section that presents the most conflict to non-credobaptism believers and non-premillennial eschatology. His ultimate conclusion of the church in the wilderness (particularly chapter 12 and 13) is a familiar motif of amillennialist but seems to contradict the covenant position that the “church” consists of solely genuine believers. Despite these areas of disagreement, Hamilton provides a strong view of the church that is beneficial of all views. For those dissatisfied with the disagreement, his fuller arguments should be addressed outside of the context of What is Biblical Theology?. The conclusion to this book has already been communicated above. This book should be read by church members interested in grasping the over-arching view of the Scriptures. It should be used by church leaders to instruct their congregants in the basics of Biblical Theology. Not without its faults, What is Biblical Theology? is the type of book that can be read quickly and loaned out safely. It would rightly deserve to become the staple for the church’s renewed interest in Biblical Theology.